Oh, Verizon! You’ve been trying to run us out for a few years now. Each year a new attempt to get us grandfathered unlimited data customers to jump ship and join in the fun of “capped” data. Several of us, nay, many of us, say “no way!” Several have left you and went to T-Mobile’s unlimited option. This guy can’t do that. T-Mobile has no signal at my work. So with each attempt you make, I dig deeper and find a new way to out fox the fox. Verizon dropped unlimited as an option back in June of 2011. This year, Verizon is increasing the cost of unlimited data by $20 per monthly bill. Originally, $30 for unlimited data will now be $50. They have closed a few loopholes in the past. Such as buying a new line of service, moving that smart phone to your unlimited line, then reducing that new line down to the bare minimum. That’s how I got my Moto X in 2013. Then in 2014, they closed that loophole by mandating that if you buy a new line of service with data, it has to keep data on it for the full 2 year agreement. 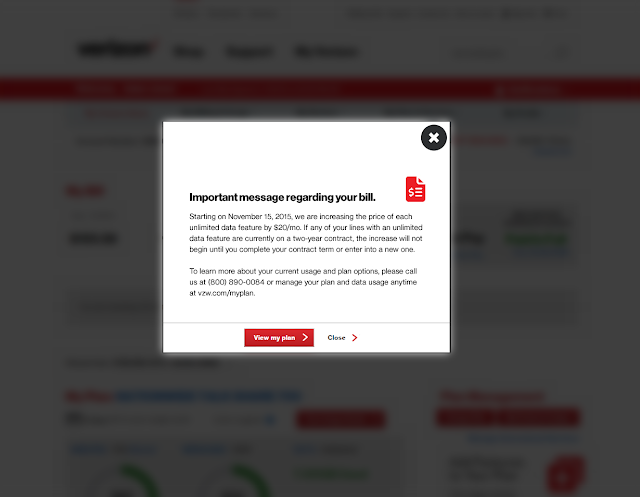 As you can see in the warning message from the Verizon Wireless website, to avoid the $20 price increase, you must be within the constraints of a 2 year contract: “this increase will not begin until you complete your contract term or enter into a new one.” So that’s what I had to figure out. How to enter into a new contract term and keep unlimited data. Let me introduce to you Best Buy website. For a few years I’ve read that other unlimited data users have been able to buy a new phone from Best Buy’s website, enter into a new 2 year contract, activate their new phone (in a specific manner), and keep their unlimited data. I thought it was time to give this process a try myself. Here’s how I did it. You must have at least 1 line on your Verizon account which has an available upgrade AND it should be one with unlimited data (to even make this worth it). Go to bestbuy.com, click “Cell Phones” along the left hand menu, and choose the best Verizon phone for you. I personally chose the Samsung Galaxy S6 because it’s on sale right now for $1 when you sign a new 2 year contract, and guess what, by the time you are done with this, you would have signed a new 2 year contract. Put the phone in your cart by clicking the yellow button “Add to package”. It will prompt you to “Upgrade my device”, “Add this device to my account”, or “Buy an unactivated phone”. You want to choose “Upgrade my device”. Then click “Check Eligibility. It will now ask for your Verizon account information such as phone number, last 4 of social, billing zip code, and Verizon password (it really means pin code). Enter that information to continue. The next screen is important. This is where it will ask if you want a device payment plan or upgrade your existing plan. Choose the latter. You DO NOT want a device payment plan. Follow the normal Best Buy checkout process by entering your billing information, shipping information, and payment information. Note: I recommend not paying for faster shipping. I didn’t and despite the ETA of 14 days, I got it in less than 24 hours. 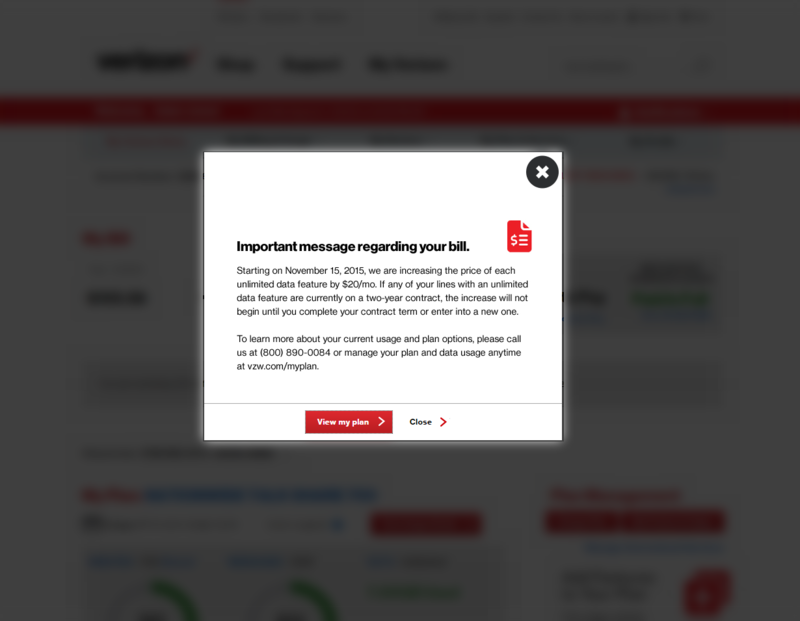 It will prompt you again for the Verizon information. Enter it just a you did in step 5. Finish the checkout process by clicking the yellow button “Place Order”. Very Important: When get the new phone in your hand, DO NOT turn it on. First, take out the SIM card and destroy it. Now, use the old SIM card from your old phone. In doing so, 2 things will happen: See UPDATE below. If you accidentally use the new sim, which has the “new line of service” tied to it, you could lose your unlimited data. You will have a “pending activation” flag on your Verizon account. It will keep you from making changes to your account. Don’t worry though. It will go away after 30 days. Also, you can call their customer service team to make any changes necessary if you can’t wait 30 days. UPDATE: I must provide this update that I have been reading many accounts where this process no longer works if you intend to activate this phone on your unlimited data line even when using the old sim card. It’s possible that this loophole is being corrected. Accounts include activating the new phone with old sim card and unlimited data is still removed from their Verizon plan and changed to a 2GB plan. It is also possible though that if you never activate this new phone on your unlimited plan, you can still keep unlimited data. I’ll be monitoring my personal Verizon account and I will keep you posted with any changes. There you have it! Ten steps for saving $444 over the next 2 years on your Verizon bill. No not $480 ($20 x 24 months). The phone cost $1 and there will be an upgrade fee on your next bill for $35. So in essence, subtract $36 from $480 and it leaves you with $444. Please enjoy your extra savings. Let me know in the comments how this worked for you. One last thing, what if you don’t need the phone you just bought? (I didn’t.) I sold mine on swappa.com very quickly and got back a very fair market value. I get to pocket that money. So truly you could do something similar and you just saved even more.